i-REAP is a two year £1.5 million collaborative R&D project, sponsored by the UK government Department for Business, Energy and Industrial Strategy (BEIS). Project partners include TerOpta, Costain Group PLC and University of the West of England (Bristol). The adoption of thermal efficiency measures has been slow and the use of low carbon measures for existing buildings accounts for only 1.6% of all the heat used in buildings (UK’s Committee on Climate Change 2016). The main barriers are the lack of awareness of the benefits and financial constraints. This project will develop a whole building approach to drive down costs of improving thermal efficiency in existing buildings. It will develop an affordable solution that will provide a personalised and optimal energy consumption regime. It will contribute to fast-forward the adoption of Artificial Intelligence (AI) and Internet-of-Things (IoT) solutions for energy savings and help the sector to move from ‘reactive’ approaches to ‘predictive’ ones. The key deliverable is an IoT-enabled Real-time Energy Analytics Platform (i-REAP) for commercial buildings, which will be a one-step solution to measure, predict and optimise energy consumption. i-REAP will leverage the characteristics of a specific building(s) to optimise heating/cooling operations and develop guidelines for ideal retrofitting actions and low carbon heating technologies. 18th January 2019 i-REAP project to be exhibited at Futurebuild 2019. The major annual event, formerly known as EcoBuild, will take place at ExCel London between 5th and 7th March 2019. Members of the i-REAP consortium will demonstrate and explain the benefits of i-REAP within the "Innovation Zone". 26th October 2018 Mike Sharratt to present at EMCC (East Midlands Chamber of Commerce) Construction and Property Forum on 12th February at the University of Nottingham. Following the success of winning the Business, Energy and Industrial Strategy (BEIS) funded project i-REAP, Mike Sharratt (TerOpta CEO) will explain the project background, aims, technology and current status to a number of East Midlands construction firms and others. He will showcase the latest thinking on the use of AI and IoT systems within the built environment (suitable for both retrofit and new-build) for energy reduction and improvement in living/working conditions. He will suggest areas for retro-fit improvement with “business case-like” costed solutions within commercial workplaces. 13th July 2018 TerOpta-led consortium awarded £1.3 million to investigate use of AI for energy efficient buildings. The UK government department for Business, Energy and Industrial Strategy (BEIS) has awarded the funding to TerOpta, Costain Group PLC and University of West of England (UWE) Bristol to carry out research into the use of Artificial Intelligence and IoT techniques to increase the energy efficiency of commercial buildings. i-REAP (IoT-enabled Real-time Energy Analytics Platform) will be a 2 year research project culminating in field trials of the system. 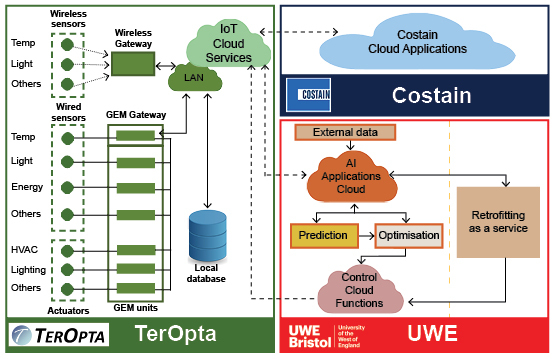 TerOpta will lead the consortium and provide the IoT hardware platform whilst UWE will provide expertise in Big Data Analytics and AI and Costain will provide test sites and a cloud-based data environment. i-REAP is a two year £1.5 million collaborative R&D project, sponsored by the UK government department for Business, Energy and Industrial Strategy (BEIS). Project partners include TerOpta, Costain Group PLC and University of the West of England (Bristol).